The muzzle is the part of the horse's head that includes the area of the mouth, nostrils, chin, lips, and front of the nose. The muzzle is very mobile and sensitive. Whiskers help the horse sense things close to its nose and the skin is almost hairless. Beneath the skin is cartilage. The poll is the area immediately behind the ears and the underlying bones are the top of the skull bone and the cervical bones of the neck. In this area are many nerve endings and acupressure points. The poll area is where the bridle path if one is clipped, begins. On some horses, the poll is quite flat, while on others it may be more prominent. The forelock is the tuft of mane that falls downwards between the ears above the forehead. The forelock gives the horse some protection from the weather and helps protect them from biting insects. Some horses have very thick forelocks, while others may be wispy, almost non-existent. Your horse's ears are very mobile and can swivel almost all the way around. This lets it tune into sounds it may hear beside, behind and in front of it. Ears are flexible too, although you shouldn't bend them as might happen when bridling your horse. 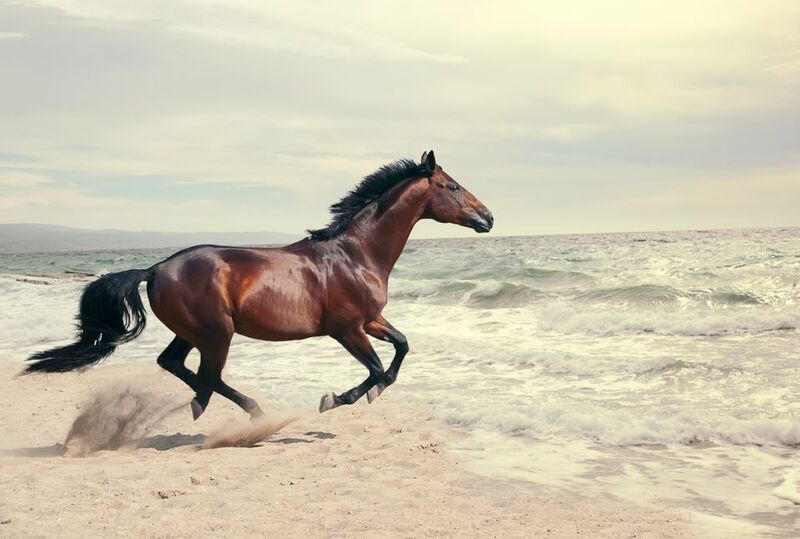 A horse also expresses itself with its ears. For example, if a horse's ears are laid flat back, watch out. Pricked forward ears means it is interested in what it sees or hears. Ears out to the side can mean the horse is relaxed, but if its eyes appear wary, it almost means it doesn't like what is happening. A horse's nostrils are very flexible. Horses only breath through their nostrils. Cartilage holds the nostrils open, and the nostrils can flare open to allow more air to pass. The folds and hairs in the nostrils help filter dust. The forehead is the area between and just above the eyes. Foreheads can be concave, flat or convex. Arabians often have a concave or dished face. Some warmbloods have convex or almost “Roman noses”. The hollow above the eyes is the sub-orbital depression. In most well cared for horses, this will be a shallow depression. Older horses or horses and ponies that have seen ‘hard times’ will have very deep sub-orbital depressions. Often the hair coat on the forehead has distinctive markings like blazes, stars or strips. A horse's eyes are set slightly on the side of its head. This enables it to see forward and backward. This comes in handy when it is time to keep an eye out for predators. The wide flat area on the side of the face is the cheek, with the rim of the bone curved along the bottom. The neck extends from the head to the top of the shoulder area, ending at the withers. There are seven cervical vertebrae in the neck. The neck is very flexible. Depending on the build of the horse it may be lean or muscular and curved. The crest is the top line of the neck. Ideally, the crest should be a gentle convex curve from the poll to the withers. On a very fat horse the crest can be very thick, and almost seem to flop over. On a very thin horse, the crest will be straight and thin. 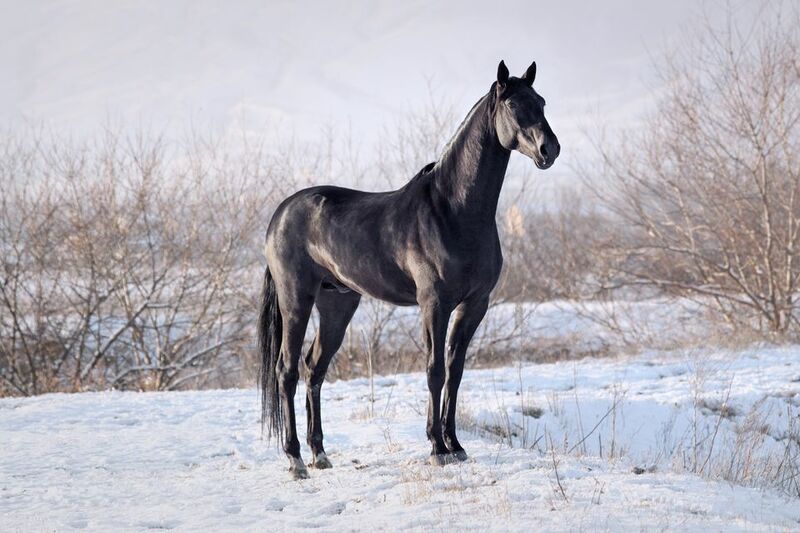 Some breeds like Morgans, Arabians, some warmbloods, draft horses, and ponies have a more distinctively crest than breeds like Quarter Horses and Thoroughbreds. The growth of coarse hair sprouting from the horse’s crest is called the mane. Some breeds like the Appaloosa have very sparse manes, while others like Morgans and some draft breeds have very thick manes. Manes provide some protection from the weather. Horses toss their manes to flick away biting insects. If you plan to pull your horse’s mane for banding or braiding you’ll need to provide a little extra protection from the bugs. The withers are at the top of the shoulder where the neck joins the body. The ‘lump’ seen on many horses is the top of the spiny process of the tallest thoracic vertebrae. This part of the vertebrae is quite high on some horses and shallow on others. Horses are measured for height from the top of the withers. The shoulder is the large bone that runs from the withers down to the chest. A well-sloped shoulder can indicate a horse that will have smooth gaits. Horses with more vertical shoulders can have choppier gaits. The underlying bone of the forearm is the radius bone. A long forearm is desirable as it can signify a long smooth stride. The radius bone on humans runs between the elbow and wrist joint. Any bones below the forearm on a horse are essentially equivalent to the bones of the hands and feet on humans. That is why it’s a misconception that a horse runs on its fingers and toes. The knee of the horse is made of several small bones. Although it is called the knee and bends forward like a human knee it is different in structure to a human knee. A human’s knee joint is a hinge joint. A horse’s knee is several bones held together by small muscles, tendons, and ligaments. The bones in the knee are similar to the bones of a human’s wrists. The stifle joint in the back leg is actually closer in structure to a human knee. This bone extends from beneath the structures of the knee to the fetlock joint below. Along the cannon bone runs a smaller bone, called the splint bone. In most light horse breeds a cannon bone circumference that is greater than 8 inches is desirable. This means the horse has a sturdy bone mass to carry a load and withstand work. These bones are somewhat equivalent to the metacarpal bones in a human’s palm. From the horse’s knee downwards the foreleg bones are vestiges of former toes. The fetlock is formed by the joint between the cannon bone and the pastern bone. At the back of the fetlock lies a small bone called the sesamoid. Occasionally, you may hear the fetlock joint referred to as the pastern joint or ankle. This joint although it may appear so, is not actually analogous to the human ankle. The horse's leg, from the knee down, has no muscle and the structures are more like our fingers than our arms or legs. This is part of the reason too, that the fetlock is prone to strain and injury. The pastern is made up of two bones that extend downwards from the fetlock. The upper bone is longer and the shorter lower bone extends into the hoof where it joins to the pedal bone inside. The angle and length of the pastern are important to the strength and smoothness of gaits. Too long a pastern, while providing supple shock absorbency for a smooth ride, may not stand up to hard work. A short pastern will be strong but the horse’s gaits may be choppier. The back is the area that extends between the withers and the loins. Beneath the surface of the skin are the upright ‘fins’ of the vertebrae. Along either side are many muscles. It is these upright boney process and muscles that we sit on when we ride. Relative to body size a short back is stronger for riding than a horse with a long back. Dropped or swaybacks (lordosis) can be genetic, caused by old age, or caused by improper riding. The barrel is the area behind the girth area to the flank. Beneath is the ribcage that surrounds the horse's vital organs. On the mare in the photo, the barrel is distended from repeatedly carrying foals. The loins are the area just behind where the saddle sits, above the flanks. This rooster is perched just behind the loin area. This area can be somewhat sensitive and ticklish, especially if the rider uses a saddle that is too long. The slightly indented area behind the area of the barrel is the flank. This is the area you watch to count your horse’s respiration. If the flank appears unusually sunken this can mean your horse is dehydrated. Always have fresh clean water available for your horse summer and winter. The gaskin is the muscular area between the stifle and the hock. The underlying bones are the tibia and the smaller fibula which are equivalent to our calf and shin bones. Underlying the stifle area is the stifle joint formed between the large hip bone (femur) which is equivalent to our thigh bone and the tibia. The horse’s tibia is equivalent to our shin bone. The stifle joint somewhat resembles a human knee. Injuries of the stifle joint are similar to injuries of the knee in humans. The hock joint is the largest joint on the horse's hind legs. The joint is made of several small bones, the most prominent being the Os Calsis which gives the hock its angular shape. The strength of the hocks is very important as this is the most active joint in the horse’s hind legs. Poorly conformed hocks may make the horse susceptible to break down if the horse is worked very hard. The hind or rear cannon bones are the metatarsals and run between the hock joint and the fetlock. These bones are similar to the bones in your foot, excluding your toes. The croup is the area from the highest point of the hindquarters to top of the tail. It is sometimes called the rump. The area at the top of the tail is called the dock. Below the skin are muscles and the extension of the vertebrae from the spine. The tail is an extension of the spine. There are about 15 small vertebrae that make up the bone structure of the tail. The muscles through the dock and tail make the tail very mobile for both expressing moods, balancing, and swishing away insects.